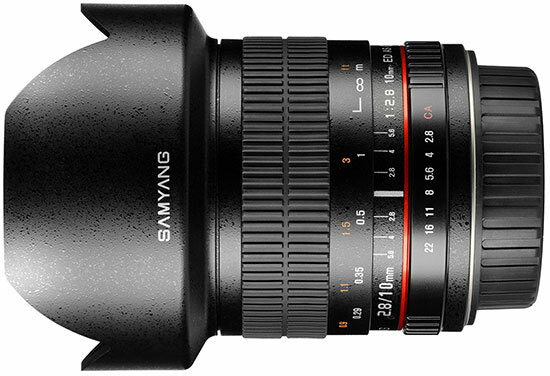 Samyang originally displayed a prototype 10mm prime lens at Photokina 2012 with a few details. They recently announced the official development of their new 10mm f/2.8 prime lens. If you’re not familiar with the Samyang line of lenses, they’re a very confusing bunch which shares it’s designs with different branding such as Rokinon, Bower, Vivitar, etc. Rokinon offers their photo lenses in a cinema variety that feature 32-pitch focus and iris gears as well as a smooth, click-less aperture and T-stop markings instead of f-stop. Needless to say, this new 10mm will make it’s way into a Rokinon Cine Prime flavor soon enough. There are quite a few interesting details about this lens. First, and possibly most important, it’s designed for APS-C and Super 35 format cameras similar to their 16mm T2.2 lens recently released. This is a shift away from their early lenses including the 8mm T3.8, 24mm T1.5, 35mm T1.5, and 85mm T1.5 which were all designed to cover a 35mm full-fame (24×36) sensor. It’s not difficult to assume why Samyang decided to go this route. There’s a huge demand in the APS-C DSLR and mirrorless market at the moment and designing a such a wide angle lens to cover a full frame sensor would require a much larger, more expensive lens. Speaking of design, let’s get to some of the details of this new lens. The 10mm will be a rectilinear lens which means that you won’t have the fisheye style of the 8mm and only minimal geometric distortion throughout the field. It’ll have a respectable maximum aperture of f/2.8 (likely a T3 for the cine-version), comprised of 14 elements in 10 groups including two aspherical elements and a single extra-low dispersion element. A removable hood has been incorporated which I’m sure was a request from many users after the 14mm was produced with it’s fixed sunshade. The lens will also have a few new tricks from Samyang such as their Nano Crystal Anti-Reflection Coating System which is simply fancy talk for coatings that reduce flares and keep the T-stop decent. The lens will produce a very nice 109.5° field of view on APS-C sensors with a minimum focus of about 10″. Other than that, you can expect the usual from Samyang and Rokinon – a plastic housing to keep manufacturing costs down and a wide range of mount options including Canon EF & M, Nikon F, Sony A & E, Pentax, Samsung NX, and Fuji X mount. Pretty much everything EXCEPT PL. …But who cares. 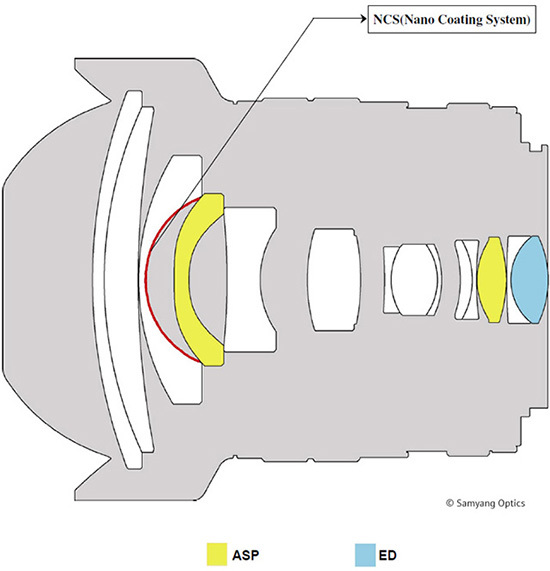 If you’re using a PL mount camera, you should be using something a bit more reliable than a Samyang lens anyway. Samyang has already produced a short video showcasing their new 10mm lens. No official word on ship date to the US yet but be sure to subscribe to the blog or to the Duclos Lenses newsletter for updates. Samyang Optics designs and makes the lenses in Korea, marketers like Rokinon, Bower are ordering production batches with their their brand names. Previous Previous post: Stolen Equipment Alert!